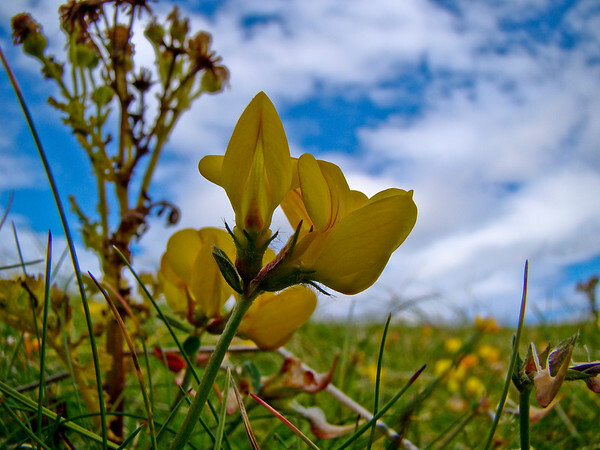 The Machair is the region just behind the dunes on the Hebrides: traditionally the richest farming land, and site of the original permanent settlements in the islands. In season it is an amazing spread of wildflowers. I cropped this shot in tight, to capture just the mass of the display of sunflowers. You can just see Ben More through them along the skyline. Shot low to the ground, using the swing out LCD on the H50, and close in, using the mid range of the zoom to compress the scene slightly. Sony DSC H50 at about 80mm equivalent. F5.0 @ 1/250 @ ISO 100. Programed Auto. In Lightroom, besides the cropping (necessary both for effect and to eliminate some distracting weeds in the bottom of the frame), I used my standard Presence settings (added Vibrance and Clarity) and Landscape sharpen. And one bonus shot. Another Machair flower view.